The Salina del Bravo region, on the continental slope just south of the Texas border, is dominated by four structures. From landward to seaward: the Bravo trough, Sigsbee Canopy, Perdido fold belt, and BAHA high. The Bravo trough lies beneath the updip part of the slope, and is characterized by a thick, intensely folded Tertiary section beneath which the Mesozoic section is thin or absent. The Bravo trough runs for roughly 400 km along strike, and is at least 40 km wide, with the west edge lying beyond the limits of our dataset. The downdip end of the Bravo trough is connected to the Sigsbee canopy by a feeder or weld. The Sigsbee canopy lies almost entirely seaward of the Bravo trough, and in most places overlies the Perdido fold belt. In many places the Perdido fold belt folds the base of the Sigsbee canopy. Elsewhere, Perdido folds are truncated beneath an unconformity on which the canopy is emplaced. At the seaward end of the system is the BAHA high, named for the first well drilled in it. The BAHA high is a structural high in the base of salt, with 1-2 km of relief in most places. Like the Bravo trough, it runs over 400 km along strike. The Perdido fold belt lies on top of or updip of the BAHA high. We interpret the Bravo trough as a former salt wall (the Bravo diapir) that was loaded by sediments during a major depositional phase in the early Cenozoic. These sediments expelled salt from the Bravo diapir into the Sigsbee canopy. This depositional phase also destabilized the margin, leading to extension beneath the present onshore (Burgos basin) detached near the top of the Cretaceous. This extension was accommodated partly in the Bravo trough, where the detachment ramped down to the base of salt, and in the Perdido fold belt. The Perdido fold belt was buttressed against the BAHA high, which formed the downdip end of the system. We constructed a physical model to test the viability of our hypothesis. This model was able to reproduce all of the major features of the Salina del Bravo region. 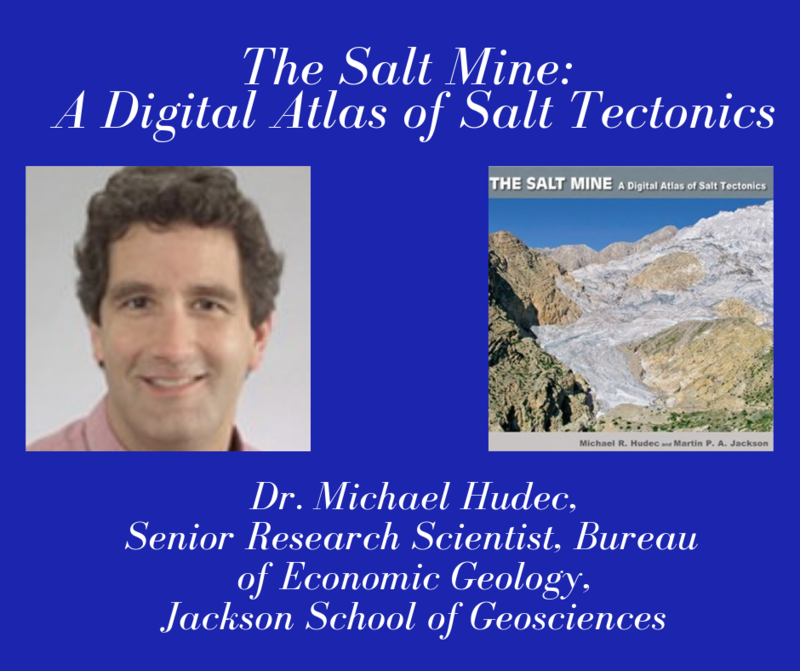 Dr. Michael Hudec is a Senior Research Scientist at the Bureau of Economic Geology and directs the Applied Geodynamics Laboratory (AGL), an industry-sponsored research consortium studying salt tectonics. He received his Ph.D. from the University of Wyoming in 1990, and spent the next eight years at Exxon Production Research, where he specialized in salt tectonics, extensional tectonics, and seismic interpretation. His current research interests include palinspastic restoration of salt structures, deepwater structural styles, and evolution of the Gulf of Mexico Basin.